Here I am all by my lonesome...well sorta, I am staying at my parents' house most nights, so they keep me company but still, I miss my husband:( I thought it was bad when we were engaged and he'd leave for the week, but I'm pretty sure this is worse. 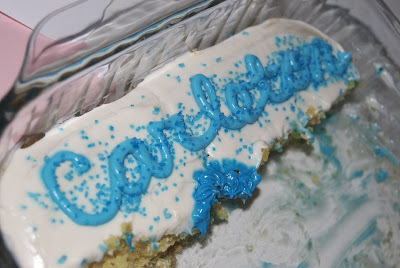 I thought it was ironic that we ate all this cake and all that was left was "Carleton" when he's the one that will be away for the next 15 weeks. 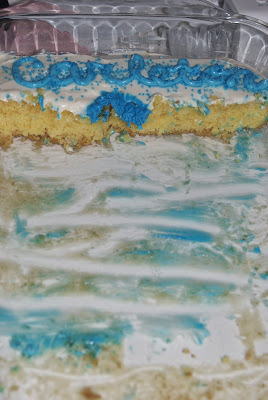 As scrumptious as it was, I wish he were here instead of just the cake with his name on it. Thank goodness I have my parents in the area and some good girlfriends to keep me company all summer!